As we enter into this new season and new Jewish year 5778, the Lord has been talking to me about some of the new things He is going to be doing. 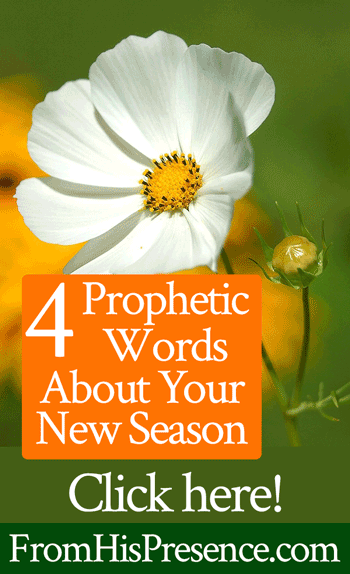 Today, I wanted to share 4 prophetic words about some of these new things. You have been praying for opportunity and the Lord is saying to you right now that you have prepared; you have fasted; you have walked with Him. He sees both your physical preparation and the preparation of your heart. Now, even though you do not currently see a way forward, your God is making a road in the wilderness. He is doing this NOW. A door will soon open and it will be a small door; but pay attention, for it is a door from Him. What looks like a small door will open up into a wide place after you enter through it. Be watchful; be vigilant. Pray for God to protect every door He is opening for you, and to close every door He does not want you to walk through. Isaiah 43:18-21. “You have long been holding back your full self from the things I have called you to do. You may not realize it, but you have been thinking of the hardest parts of your life as the parts to keep hidden. However, I see those parts of your life as the diamonds around your neck. They are what make you shine. I am calling you forth from the diamond mine. I am bringing you to light, and I am giving you grace to share your testimonies with others. Do not refuse My people the blessing of seeing your diamonds. Your testimonies will release the prophetic word into their lives so that I can do the same thing in them that I have done in you. “I am releasing a family to you. That which has long been held up is going to be released. You have long cried out to Me out of your lonely place, and you were right to do so. I am the One who sets the solitary in families. I see someone who is a great lover of sports. Healing is coming to you. Your heart has been bound up in chains because you were abused in the past. You were not honored or respected as a person, but you will be again. The healing process begins with receiving God’s love for you. Ask Him daily to open your heart up and remove the calluses and scabs from your heart, so that His love can seep into your very pores. Your Father loves you. He has made you strong on the outside, working many things out for your good. However, you have not felt strong on the inside. You think no one knows your struggle, and people may not–but Father God does. He has not forsaken you, and He has not forgotten you. He has tattooed you permanently on the palm of your hand, and He is with you to bring you through safely and in health. Be strong and of good courage, for the Lord your God is with you wherever you go. He will not faint nor be discouraged with you; He will walk with you as long as it takes and longer. He will never abandon or forsake you. Only ask Him to pulverize your heart before Him, so that you can receive His healing touch. Again, if one of these words is for you, please leave a comment below! I love hearing from you! It is so amazing to hear these affirming words from the first 2 messages. Surely this must be God speaking to my soul, the scripture “my grace is sufficient for you, my strength is made perfect through weakness”. I have been coming accross a lot lately and on my mind, especially when i dont seem to be going anywhere with my new business venture. ” Your testimonies will release the prophetic word” Confirmation of what I have been hearing from The Lord! i kinda feel like these are all me!! He who began a good work in me will accomplish it!!! AMEN EVERYBODY!!! The Lord simply amazes me Prophetic Word #2 is now been spoken to me on the 2nd occasion for today…Jesus is alive his not dead..Praise God for your anointing may the blessings of the Lord continue to flow. To God be the Glory and Honor!! Thank you Jamie… The last two were meant for me and brought tears to my eyes! Praise the Lord, praise the lord, Alleluia Alleluia Alleluia Alleluia!! Jamie, It’s word #3! This has been 58 years in the making.!!! I was adopted at age of 3.Only Yah could have known the love and care that I would need. My adopted parents gave me every thing I needed, even if dicipling were the case. Moving along through the decades, I knew that I have 3 other brother and sister’s. Just this week, yes this week I received the sealed file concerning my birth records. I went to the Ancestry.com site and working with the information provided, I can say that ground is being broken to reveal the hidden things. Thank you greatly for being obedient to Father’s call on your life. Thank you! Thank you! Praise God in Jesus name! Those words gave me the push I needed to continue pushing in Jesus name to share and do what I can for Kimgdom building. For sure many are still needing to hear our testimonies about the goodness of our Lord and Savior; and how He transformed our lives. To God be the glory, in Jesus name! Thank’s again for the encouraging message. The first three is for me (123). I nearly cried as I was reading them. The small door opening and to pay attention, something I’ve been praying for, along with some Church members. The diamonds, I share my testimonies even through my suffering, and wanted to give up. This one is the most deepest to me, because I’ve been really talking to God about somethings (my heart is full of joy right now). He also gives me prophetic dreams, that seems to come to pass swiftly, but I felt like I was in the wilderness. My Lord, my Lord! And the last one about a family member, especially the loneliness. I know God hears our prayers, no matter how long we have to wait. 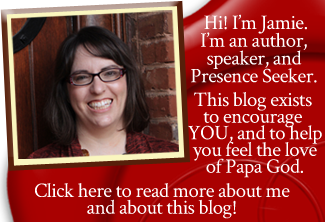 Also Jamie, you’ve been in my prayers, seeing your blogs can help me to do so more often. I know God has His hand on your life, and I plead the Blood of Jesus on you and your family. I will definitely help to support the work God has for you to do in the ministry. Amen! Jamie thank you. Abba Father separate me from Satan, those who are tools in his hand and those who are purposed to take me from Your hands. Amen. Most prophetic words can apply to anyone with the faith to receive, Davina. Read 2 Corinthians 1:3-5. If you have faith to receive the word, God will do for you what He spoke in the word. If you do not have faith to receive, you will not receive anything from the Lord. James chapter 1. “Believe in the Lord your God, and you shall be established; believe His prophets, and you shall prosper” (2 Chronicles 20:20b). My credibility is not at question. I simply speak as the Lord tells me to speak, and whether the hearer receives it or not is completely up to them. God bless you for these #4 prophetic words from Jehovah! I actually can relate to them all, I woke up this morning with a heavy feeling of loneliness, and not knowing. But after reading and meditating on these words with a lot of tears and stuffy nose, I can testify to the awesomely goodness of God’s unfailing love and victory. I felt lighter and felt God’s arms around me. Wow, God is truly Awesome and Spot on! Thankyou Sis Jamie…Nos. 1,2 and 3 resonate with me, where I am coming from and where I am going… Been in a place of waiting, a wilderness, but truly I have seen The Lord. Everything in our family was at a standstill. Then my Lord brought the battle to the surface. Been a wrestle truly. However, in the midst of it all, He has overcome the very wilderness of my heart and created an oasis instead. Though I know the process is daily and can last for a lifetime, I am glad for He has confirmed that He is now keeping His Promises over my life. Am a mother of a son, and am looking forward to a husband that God said He will bless me with! at 40 for your info…. He is God. Truly like David in the Psalms, I have tasted of the Lord and have seen that He is Good. Be blessed even as you look forward to your miracle. Thanks for the prophetic words! 1 and 3 resonated with me. Be blessed and encouraged!!! I thank you for the word, yes it apply it to me, blessings and much love, you are faithful this word give me hope, ?? ?, thank you !! Wow….Praise God. No.2 and 3 were most definitely for me. I have specifically rejected many speaking requests in the past year and said within myself I would not speak my testimony anymore because of the hurt I’ve been going thru. Slowly but surely I have softened my heart and have been blessed to hear others testimony and considered speaking again, which He has anointed me to do. This Word confirms it. No.3 I have been praying for a group or community of women ministry leaders who are wives & mothers, as well as a mentor….I believe this to be the family for me. Word no.1- I cannot believe it. I just finished reading isaiah 43 and God spoke to me about doing a new thing in my prayer this morn. I had a dream about an open door…and on the other side was written abundance. Woman of God I love all the prophetical words you send me, but all you have send me to day, every one of the for is for me its like a last nail in the coffern.Its like a arrow that point straight at me and can’t miss.We serve truly an awesome God. Jesus is Lord.Let their be light in my life.I believed I received it.I love you! God bless.He had never in life had forsaken me.He is not a respecter of persons what He can do for others He will do for me.Greater is He that is in me, than he that is in the world. I’ve got the life of God in me.I’m the seed of Abraham.Blessed be God. This was for me. It speaks to the turmoil I am in now. I really needed a word from God. thank you, you were talking to me Jamie….all this was meant for me…when l came to number 3 l was in tears….God is indeed forever faithful and this is my Word in season. you really God Sent to me and my life Jamie. may God continue increasing your territory, ministry and everything. Definately 1 and 3 resonate with me. 1 especially as only yesterday after a long time of battling with” what am I supposed to be doing with my life” and feel I am wasting time although have been using the time seeking and spending the time with Jesus, that I felt complete surrender and peace that this is part of God’s plan and I am in the right place for now. There are 3 options of work or study I could do right now but it would only be for filling in time and not fulfilling me, so I wait. Thank you! Word number 4 was for me! So spot on! I so needed this! Thank you Lord. I recieve it in Jesus name Amen. Thank you! All of them speak to me . I was able to see me in each one. Wow!!!! Praise God for such a Rhema Word!!! 1,2,and 3 were just what I’ve been praying and believing!!!! Jamie, thank you for your diligence and obedience to Papa God!!! I’ll pray that the Lord continues to build a hedge of protection around you so that you may continuously hear from Him!! Jamie, I’ve been following you for sometime and you have spoken into my spirit more times than I can say and I’ve been able to forward your prophetic words to others, as well, for encouragement. God is using you in profound ways. I look forward to what He has to say through you every time I open my e-mail to find you there. Bless you, Jamie! As for these last two messages, God has used you to confirm some big things in my spirit that I have been longing to hear for some time. And today, #1 especially resonates because I have been praying Isaiah 43:19 and 44:2-5 for many months. Thank you, Jamie, for your willingness to be used by God in this way. Praise be to God! Jamie your prophetic words resonate with me and my family 1,2,&3 is a NOW word for me # 4 thank God HE has healed me and in reading this one, a sister in Christ came to mind and so I prayed this #4 for her. #3 has my name written all over it. Thank you Jesus for new family. Thank you so much for the Word of the LORD! Word #1 is very accurate as there has been many adversaries (1 Corinthians 16:9)! Word #2 hits my heart in a very special way as I have been hiding my wounds so that people wouldn’t see my great pain! Word #3 makes me want to cry because the abuse that I’ve suffered at the hands of blood relatives over the years has been unbearable! God bless you, Woman of God, Jamie Rohrbaugh! To God be the glory??? This post ministered to my spirit and gave me hope in the mist of the wilderness. My ears, eyes,spirit and heart is open to receive from our heavenly Father Papa?. Thank you for this powerful word! On time word( food for my soul)???? Glory to God- Words 1,2,3 were for me. As I have been praying and seeking God to bring breakthroughs in these areas. May the Lord continue to use you for His Glory. Truly we serve an awesome God. The first three prophetic words are God speaking life into those areas of my life that He has heard me praying and pleading about. Especially Word 3 that speaks about family. He who puts the solitary into families. It is as if He yelled at me ….my middle name is Solitaire..meaning solitary or alone. Crying with joy and feeling His love and peace washing over me and my little boy. Thank you Jamie and may He continue to cover you and keep you under the shelter of His wings and bring you through your pregnancy and fill you continuously with His Spirit and bless your family in abundance. Receiving your words No’s 1-3. By His stripes we are healed. To walk into this next season where the latter house will be greater than the first. He is both faithful and safe to trust. Thank you for bringing these Balm of Gilda’s words to us today, Jamie. May we apply them to the deepest places. Thank you Jamie, #4 is for me! Jamie, Oh Jamie, Oh Jamie! 1-3 resonated very strongly on an emotional and intellectual level with me but 4 hit me with a tremendous force. I had an incredibly strong physical reaction. I couldn’t breath while my heart raced uncontrollably and I moaned involuntary. I have never been touched like this before. I am actually not a very emotional person. Thank you for opening yourself up to Father’s prophetic word. Thank you, Father. Hallelujah and Amen! I am very much blessed by the word. We worship a living God. The lord that answers by fire is our God. All most all the messages are related to me . I have taken them as if God spoke directly to me. May God bless you and your ministry. Thank you Jamie. Mainly 2, but in a way each one resonated with me and I believe God to be letting me know that He’s going to work things out for our good and His glory and I don’t want it any other way. He knows what His plans are even though I don’t. May ALL of it be for His glory. To God be the glory great things He hath done! So awesome, thank you so much. These really spoke to my heart. I want to know how you get Words that are so specific? Do you see them in your mind? Do they flow from your heart out into written or typed words? It’s like you know the hidden conversations I’ve had with God, and some of the specific aspects He has been using to speak to me- Diamonds for instance, and mining. Family, and loneliness, and even Psalm 68. I know about Prophecy, but I’m very curious about your process. Do you have a teaching on it? #4 for me. Thank you Jaimie. I pray God will open my heart wide open and fill me overflowing with healing and love! By Jesus’ wounds I am healed! Hallelujah!!! What a mighty God we serve. Every word spoke to me from being abused to praying for family. Both sides of my family disowned me when I spoke out that my dad sexually abused me and his dad did his daughters as well. I feel lonely I don’t feel like I’m loved by my family and God had to show me about 15 years ago that He loves me. So I constantly hasten to HIS throne. I need to hear a word yesterday I sat down and talked to Jesus. I need to know which way to go and how to do HIS will. I’ve read this three times today. God many blessings and increase to you and your family. It’s my word,I wholly take it.blessings to you. #3 is always relevant. Been waiting a very long time. But #4 is curious. I’ve needed job breakthrough for quite some time. The situation I’m in now is very dark. I’ve been trying to get out but inexplicably have not been able to. I just applied to a great but extremely hard to get job at a beloved and huge SPORTS entity. I’m qualified but it would be God if I got it, no doubt. Thank you Jaime . For your words! 1-3 is right on Point for me. But I know I’m not alone as so many brothers & sisters are going thorough the same things. I have kept my testimony to myself in fear of my children finding out the Things I’ve done before Christ. But I know now that God has redeemed it for his glory. Thank you for your love & encouragement in bringing us the word of the Lord. I pray you the blessings of the Lord over your life. May he continue to speak his heart to you. Thank you for forwarding such accurate great encouragement from above. Wow, Thank you so much for this Jamie, the First, Second and Third Prophesy speaks directly to me. Its perfectly true, exactly. Amen Amen. May God empower you even more to continue to do this great work and may He reward you generously! Wow! I read your 5778 message on Elijah’s list and then I came to your website, and God has ministered to me so much through your faithfulness and obedience in your calling. You have paid the price for others to be ministered to and I truly thank you from the bottom of my heart. May God continue to bless you and give you the desires of your heart! Glory to God. The first three prophetic words are directed to me. I have been praying for breakthrough and favor because majority of my life have been full of rejection, hatred and Loneliness. But I choose to look up to God and I want him to fill me with his love, my first love. Jamie, you are such a blessing to my soul. May God increase you and elevate you. More grace in your ministry. Jamie, those words spoke so much encouragement to my heart. I feel like they were meant just for me! My life is in so much turmoil right now and I feel like I’m heading over a cliff (but I know that’s just the enemy pushing my emotional buttons). Praise the Lord for His goodness. Praise Him for speaking through you. May He always bless you and your family and your ministry. Thank you for your blessed words they are very personal and I am in agreement with God may his will and purpose come to pass in my life a and the lives of those whom he has set apart for such a time as this. Thank you Jamie, this is an specific word for me. I cant stop crying thinking of such much Love of the Father for me. Thank you. I need it this today.? Thank you so much for sharing! What a blessing to me! Confirmation on what the Lord has been speaking to me! It feels like they were all for me! Let us watch and pray. Wow! Feeling so loved by the power of His confirming words… all four were hitting me. Thank you, Father God and Jamie for your obedience to share. Oh yes Jamie I thank God for using you for revealing this prophetic words. Yes indeed I will give a testimony that no one will believe.. yes I will have a family and children and the loneliness will fade away just like the morning fog.. opportunities will knock on my door and will find favour in my walk of life. I receive in Jesus name the Christmas. Be abundantly blessed Jamie.. these prophetic words really touched my heart and blesses me a lot. May the portals of heaven be continually opened upon your life in Jesus Name and may His Name always be glorified in our lives as it is in heaven! Thanks again and continue to be blessed in His Holy Name! Thank you Jamie for your obedience. I believe all the 3 words are confirmation in my spirit and I take it NOW by faith . Woman of God thank you so much. Number one to three are directly for me. Glory be to God. Help me to commit to what you call me to do. All of them hit home. I receive it in the Name of Jesus. The first three was for me, I know we serve a prayer answering God. I was reading them with tears in my eyes. Because, it was if God was speaking directly to me. Along with my Church members in agreement with me, I’ve been believing God for a particular door to be open and to have His favor upon my life, not the favor of man. But His! #2 spoke the loudest to me, because my desires is to please God no matter what, over anything else in my life. God gives me open vision and prophetic dreams. I sometimes share my testimonies and lately I’ve been discourage. I felt like I was in a dry a place. Now I know exactly what to. #3 I’ve been praying for a love one salvation. Last week, I was praying, I told God “I don’t know what else to do, say or pray. Forgive me for standing in Your way, I release the whole situation in Your hands. This person I’m praying for is in a position, to led many to Christ (all four corners of the earth). The “loneliness” part, I laughed, because God know exactly what to tell us, when we need it the most. Jamie, I will help support the work that God is using you to do. You and your family are in my prayers. i claim #1, I have been praying and fasting. I believe God will give me double for the 2 promotions that were stolen from me. Thank you for these encouraging prophetic word! I wait in expectancy for He is faithful to keep His promises! WOW…over here crying tears of joy thank you Abba Father for your love, healing & faithfulness. All these words spoke to me but #1 & #2 stood out. I was in such a bad spirit that it took days for me to read this message. Oh but God has perfect timing and knew that I was only going to be receptive to Him and His word today. Thank you for your obedience. My prayer for you is that you always hear from God especially for those that sometimes can’t during times of trial, turmoil and strife. Thanks you Lord for these 4 words. I receive them as they apply exactly to my situation. Thank You Lord for hearing my cry. It has taken me a while to reply but each one grabbed my hand and is walking with me. You know how you can feel so alone and then BOOM there is the Word you needed. I did have a lot of chains from verbal abuse that caused me to not just forget who I was in Christ, but who I was. And I have been standing on Psalm 68:6 about family for along time. All four spoke to me in different ways, but 3 and 4 the most. Thank you for your obedience in the Lord to share with us. Thank you Jamie for the 3 words. We are truly blessed, this is a revelation of what is about to happen in our lives. May God continue to bless you abundantly. 1, two,and 3. Thank you for this word. Blessings and peace to you. I receive it. In Jesus’ name. Yes, He is! Thank you for reading! I praise God for blessing you! He’s so wonderful. May He show Himself to you as your Glory and the Lifter of your head today! With the exception of the portion about ‘a great lover of sports,’ everything spoke to some part of my life. This word was so encouraging to me. I especially needed to hear about the diamonds. I long knew that God would use the despair and desolation of my life to bless others through my testimony. But I never thought of my scars as being diamonds. I thought of then as being tawdry, to only be brought out in front of others who suffer as I had and needed a strong testimony to encourage, comfort and strengthen them. thank you for the good word that you always bring forth the God’s glory. I would like to think #s 3and4 are applicable to me. I have been disappointed for a year. On certian matters. If he can help my unbelief. The first three points was for me.